As a Highly trained mountaineer & Rock climber he is unique to open many legendary new routes in the Himalayas including the legendary Priest’s route between Kedarnath to Badrinath via Panpatia glacier & later via Swargarohini all without any Sherpa/Guide. He Pioneered the route from Badrinath to Gangotri via Chaukhamba / Chowkhamba col. 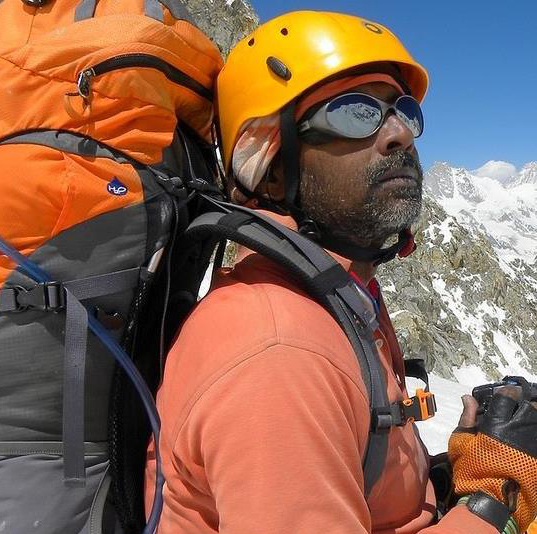 He became the leader of the National mountaineering team of IMF and so far led some 40 odd expeditions and climbed 28 peaks by virgin routes including Bhagirathi-III & II, Menthosa, Chamser Kangri, Chomo Ri, Zalung Ri, Kundanma Ri, White Dome, Kalindi, Uja Tirche, Gangotri-III etc. in India and Mt. EVEREST (North-Easr ridge-2014), Kilimanjaro, Mt. Blanc & Mt. Fuji abroad. In addition to 5 Indian Languages including Sanskrit he speaks English, Japanese & Nepalese fluently. As a practicing Brahmin he prefers to share his knowledge to let others know the wonders of Indian subcontinent, Hinduism, Yoga & Ayurveda. A professional UIAA & Govt. of India, Ministry of Tourism approved Guide-Lecturer & Tour Organizer of India, Nepal & Bangladesh; Deba/Debu is well-known for his knowledge on Indian Culture, Religion & Spiritualism. His knowledge in Sanskrit language helped him to study & practice intensively in various roots of the Indian Philosophies. His expertise in Yoga, Meditation & Ayurveda made him Popular amongst the Tourists, Trekkers traveled with him. Well acclaimed regular writer of English, Japanese and Bengali travel magazines like Indian Mountaineer, Himalayan Journal, Bhraman and Himaraya (Japanese) Debarata is a Motivational Speaker too. He is Executive body member of The Himalayan Club & TGFI (Tourism Ministry approved Tourist Guides Federation of India). Life Member of IMF (Indian Mountaineering Foundation) & YHAI. He is also Honorary member of many other Mountaineering and other social organizations. A trek / tour with him is a Lilfe-time Experience.